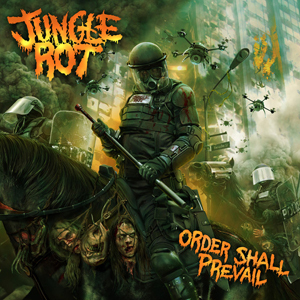 JUNGLE ROT bring you their controversial new video for "Doomsday". Additionally, the death metal servicemen are presenting your chance to win an Order Shall Prevail package at Lambgoat. The exclusive package includes a rare vinyl test pressing, camouflage hoodie, autographed CD, and two autographed posters. Enter to win an exclusive JUNGLE ROT package from Lambgoat HERE and check out the "Doomsday" video on KNAC.COM right HERE. With the recent announcement of the Metal Alliance Tour, you can catch JUNGLE ROT in a city near you. "We're definitely looking forward to getting back on the road!” continues Genenz. “It's been a few months since we've been out and we are excited to perform for our fans again alongside our tour mates. We have a long history with DYING FETUS going as far back as the demo days, and our former drummer Jesse plays for BLACK CROWN INITIATE, so this will be one big, fun road reunion!"